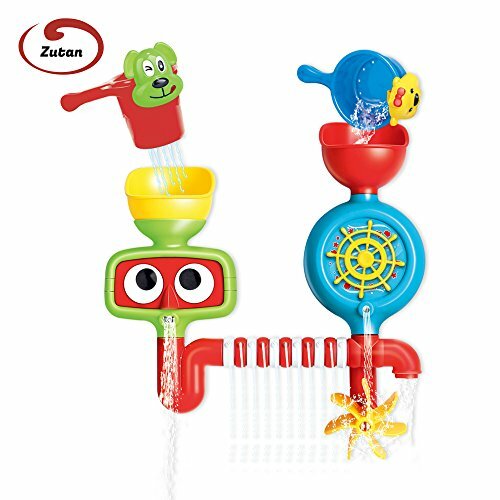 ZUTAN WATERFALL WATER STATION – COMBINES BATH TIME AND PLAY TIME! Is your baby looking to get out of the bath as soon as he touches the water leaving you frustrated as you try to hold them down? 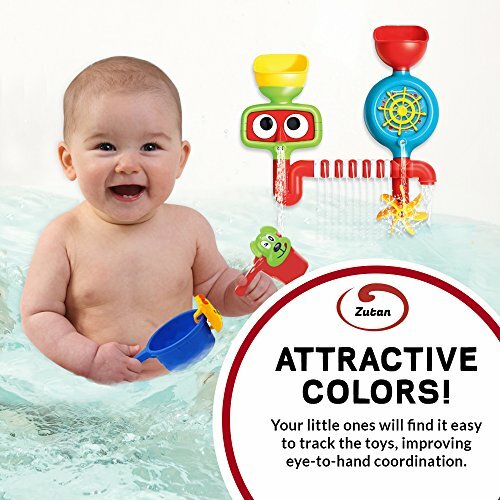 Or, are you searching for a baby bath toy which is attractive, interactive and give hours of fun for your little kids? Look no further! We have a perfect toy to turn your bathtub into a great learning and fun filled arena! The mini water fountain features two chambers where kids can pour water in. Then they can see how water rotates the roulette wheel, eyes, and turbine, spray out from the holes and flows out from the roulette and pipe mouth. This will give hours of entertainment for your kids and teaches complex forms of cause and effect that help develop their hand-eye coordination, shape recognition, motor skills, cognitive and sensory abilities as well as their problem-solving skills. You too can join with him/her and play the water toy together. It will create a perfect bonding between you and your baby and promote healthy social and emotional development of your kid. NEED MORE REASONS TO CHOOSE OUR WATERFALL BATH TOY? ✅ Made of BPA free and non-toxic ABS plastic. No choking hazards and totally safe for your kids. ✅ Comes with 2 lightweight and easy to handle cups with adorable cartoon characters. ✅ Quick and easy to set up. Simply use the suction cups to attach it to the bathtub wall and start the game! ✅ A priceless gift you can choose for new moms, parents and babies. Also, it is a perfect baby shower, Christmas or birthday gift. ✅ A great toy for children of all ages. ✅ Two kids can play together. Ideal for twins and families with 2 or more kids. ✅ Not “5 STARS HAPPY”? Simply return the package and enjoy a 100% cash back! ☆ MAKE A BIG SMILE. 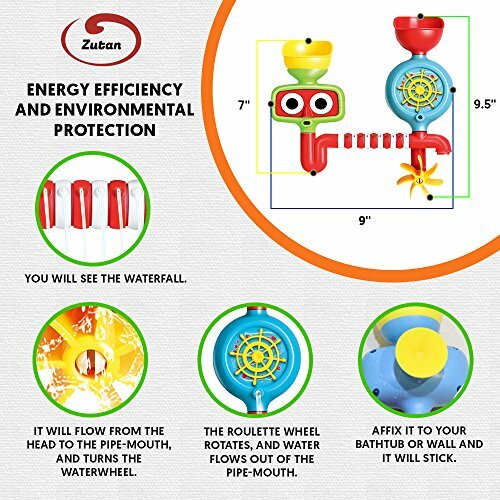 Make bath time fun for your baby and easy for you with Zutan Waterfall Fountain. 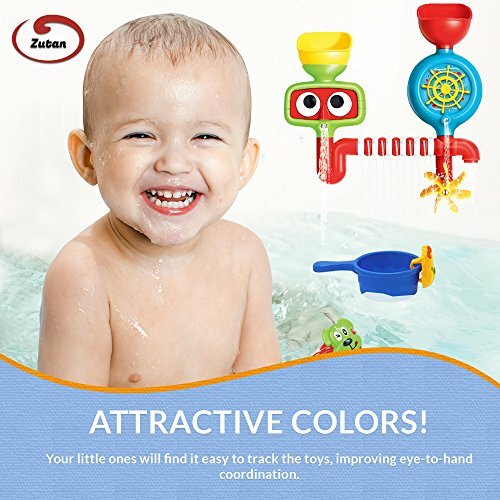 Its bright and cheerful colors instantly grab the baby’s attention and its magical mechanism will spark his/her curiosity to explore it more and more. ☆ AN EXCELLENT FOUNDATION FOR PLAY AND DEVELOPMENT. By pouring water and watching it flow through various shapes, your child will learn how water behaves which stimulates their cognitive abilities. 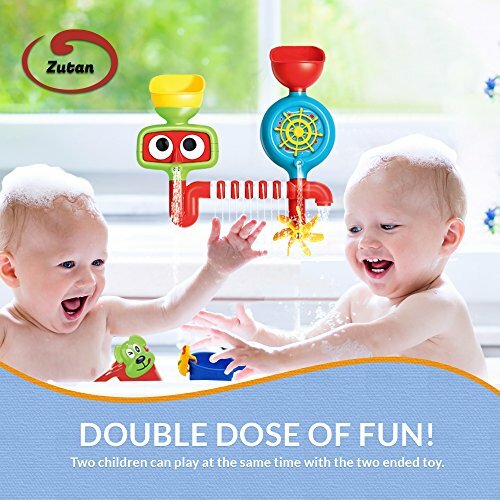 Also, our bath toy enhances hand-eye coordination, motor skills, promotes logical thinking and develops parent-child communication. ☆ NEAT AND ATTRACTIVE DESIGN. Our water fountain is made from BPA free and non-toxic ABS plastic, has rounded corners and smooth surface, so you need not to think twice about the safety of your little kids. It is easy to setup and comes with 2 cups with detachable cartoon characters. ☆ A WONDERFUL GIFT. Our interactive kids water fountain is the most appreciated birthday, Christmas or baby shower gift you can choose for new moms, babies and parents as well as for your kids and grandchildren. Trust us, they will thank you for this priceless gift. ☆ SWEET SATISFACTION GUARANTEED. We have made a complete commitment in making you happy with your purchase. But for any reason if you are not completely satisfied, simply ship it back to us and enjoy a complete refund. No questions asked. No small letters.